Test your mental might with Gravity Maze. The logic puzzle challenges your visual perception and reasoning skills as you try to create a path for the marble to roll along. Direct the ball from its raised starting point to the target on the board’s lowest level with a track you design. 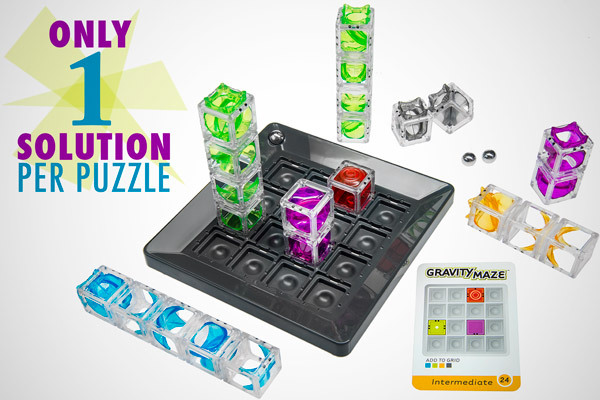 Each of the translucent towers can be arranged, rotated, and even stacked on the board to create a three-dimensional route for the marble to traverse on its way to the finish line of a solved puzzle. Sixty different puzzles ranging in four different difficulties will give you a full-brain workout. If you’re thoroughly stumped, the solution is printed on the back of each card. Game board dimensions: 6.5" x 6.5" x 1"
In Gravity Maze, the goal is simple: get the marble from here to there. But accomplishing this goal on a 3D maze is anything but easy. Each challenge card describes the starting and end points for the marble and which towers you can use to make a path. 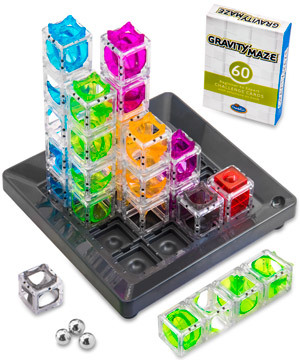 Use your brain muscle to figure out how to make gravity carry the marble over, down, and toward the target by rearranging and rotating the towers. Guide the marble as it drops through the maze. Are you clever enough to master the maze? 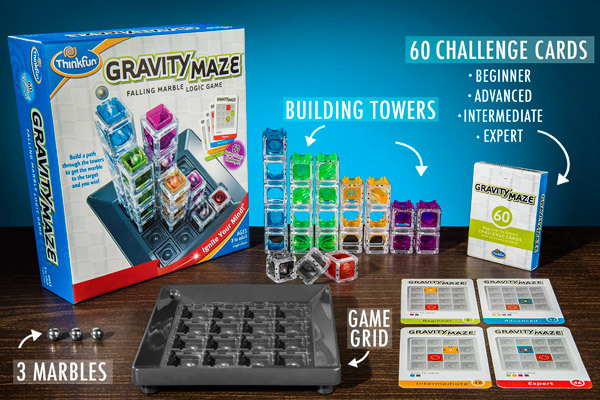 Gravity Maze has sixteen board positions, ten towers, and twenty ways to orient each tower. In other words, there are a ton of ways to set the pieces on the board grid, but there’s only one way to solve each challenge. Simply put, you’ll have to muster up all of your puzzling skills to solve each maze. You gotta figure this out, ‘cause we’re stumped. 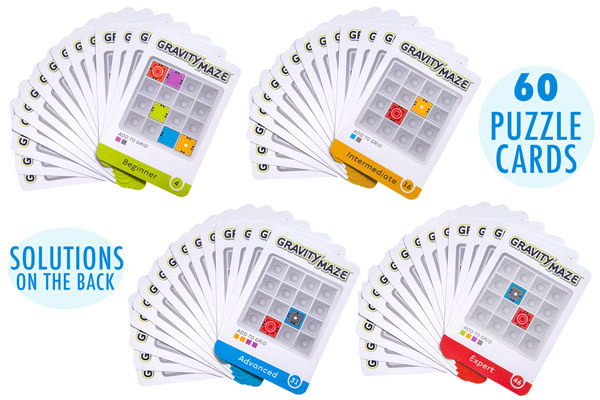 Gravity Maze comes with sixty puzzles in four different difficulty levels: beginner, intermediate, advanced, and expert. Solve them all and you can savor the joy of solving sixty super-hard maze challenges! Mazes on mazes on mazes. How the heck do you solve this thing? Here’s a hint: just because the towers are tall and narrow doesn’t mean they have to stick straight up. It’s like a hamster tunnel for your brain. 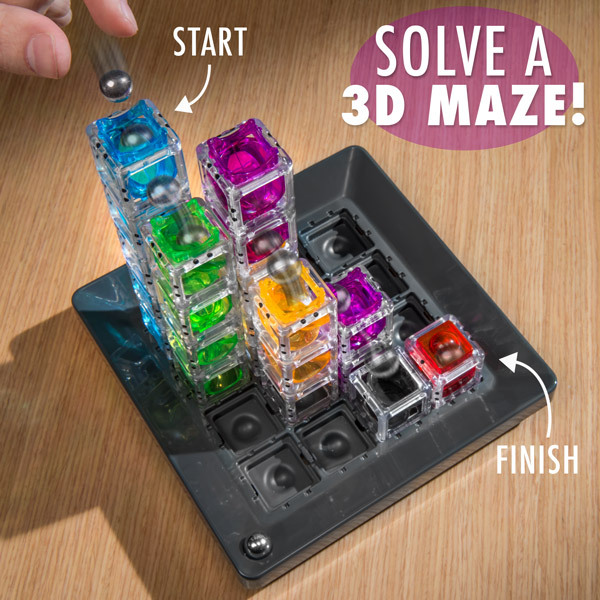 Gravity Maze is a complete 3D puzzling package. 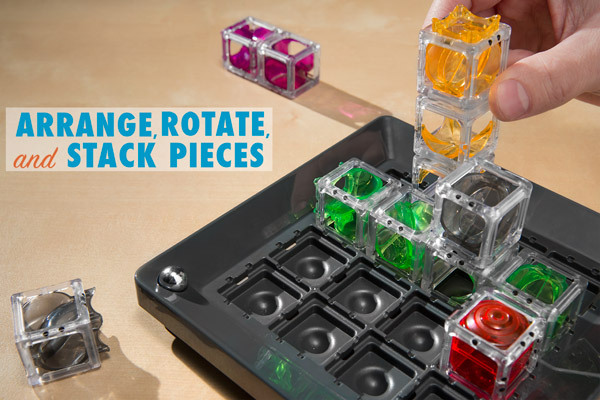 Ten building towers snap into the sturdy game board. With three marbles and sixty challenge cards, you’re all set. It comes with everything you need to solve it... except a brilliant mind. Amazing marble run construction cubes.